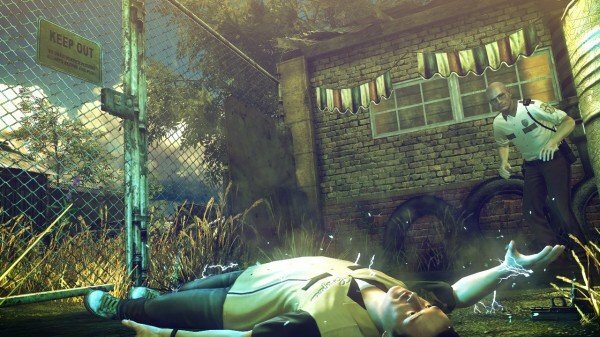 Hitman: Absolution is a quirky, interesting and memorable sequel, which fans of the franchise should fall in love with. Even though the film industry regularly releases movies based on assassins, video game developers seem to prefer going with more identifiable character types, such as soldiers and everyday folks. However, that’s not to say that the interactive hobby is devoid of contracted kills, because it’s not. For over twelve years now, European developer IO Interactive has focused its energy on creating memorable experiences that centre upon an incredibly well trained murderer for hire, who happens to be known as Agent 47. As seasoned gamers and longtime fans will note, the aforementioned master of disguise is the driving force behind the Hitman franchise. Known for being one of our industry’s most popular long-running brands, the series has built a sizeable fan base since its inception in the year 2000, and for good reason. After all, it presents an interesting mix of both stealth and third-person shooting gameplay, delivering digital playgrounds that allow users to choose how they go about completing missions. After a lengthy spout of inactivity, the barcoded assassin has returned to his digital job in Hitman: Absolution, which is now available for Xbox 360, PlayStation 3 and PC. The long-awaited and understandably anticipated sequel has released to quite a bit of buzz, which doesn’t come as much of a surprise. Of course, this isn’t a series that receives annual releases, unlike other popular intellectual properties. As such, folks will expectedly be more critical of what they’ve received. However, with that being said, that shouldn’t be a problem, as Agent 47’s latest outing happens to be well-made, creative and memorable. Chopped up into nineteen different chapters, plus a concluding epilogue, the ten to fifteen hour-long campaign is a rather quirky ride. Full of colourful and interesting characters, it focuses upon the barcoded hero and his personal plan to save and protect a special young girl. 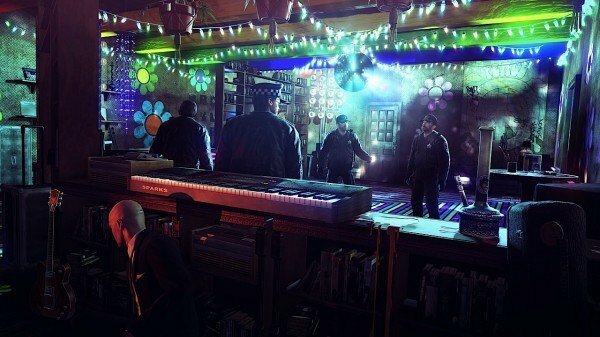 The resulting plight sends players on a trip to interesting locations within America, including the dusty town of Hope, South Dakota, as well as the dark and dangerous alleyways of Chicago, Illinois. From start to finish, the plot remains interesting, and a lot of that is due to its writing. Non-playable characters always seem to have something interesting to say, creating conversations that are almost always worth listening to. Commendation should definitely go towards the script writing team, because they certainly succeeded at creating a living, breathing and immensely colourful game world, which is important when it comes to this type of release. After all, the gameplay can only be as noteworthy as the missions’ locations are. Without spoiling anything, I’ll let you know that you can look forward to interacting within a crowded take on Chinatown, a Hawaii-themed motel, a couple of crowded bars and the apartment-based home of a group of hippies. If you’ve played a Hitman game before, then you’ll know what to expect from Absolution when it comes to gameplay. Each mission tasks players with finding and taking out highlighted targets. However, that’s easier said than done, because the baddies’ bodyguards are plentiful, and they’re not afraid to call back up. As such, being successful comes with a lot of trial and error, and requires strategical thinking. If you go in and take guys out at will, you’re more than likely going to be discovered somehow, which will result in flying bullets. Agent 47 isn’t a superhero by any means, so being shot is something you will obviously want to avoid. The protagonist comes with a limited amount of health, and checkpoints rarely replenish it, so when you do end up getting hit, make sure to scour the area for a first aid kit. 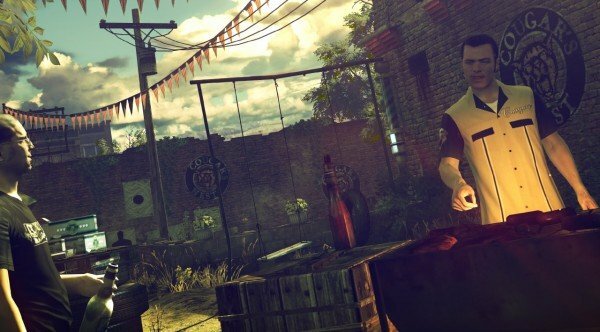 While the aforementioned narrative and its unique scenarios are certainly worth writing home about, the most impressive facet of this game is the amount of choice it offers. That’s because each mission can be completed in different ways. If you want to go through without alerting anyone, in an attempt to get a silent assassin rating, then you can do that. It’ll require a lot of trial and error, but it’s definitely possible. However, most folks will end up having to take out at least a few foes in each area, in order to steal their clothes and perhaps even their weapons. That’s what I did most of the time, and it was enjoyable, despite occasional moments of frustration. In other interactive experiences, costumes are used as a way to seamlessly sneak by guards or other non-playable characters. That isn’t how IO Interactive designed its latest release, though. You will want to steal the outfits of downed and hidden bad guys, but assuming their appearances will not come with a smooth sailing guarantee. Somehow, guards can see right through every disguise, even those that fully cover 47 from head to toe. Although I certainly agree that things would be too easy if changing clothes turned missions into cakewalks, it’s almost as if the enemies are all master detectives. It takes away from the game’s immersion. Those who end up trying to make their kills look like accidents by using the environment to their advantage, will need to sneak by a lot of NPCs in order to do so. Thankfully, the familiar agent does have one trick up his sleeve, which helps him elude discovery. That would his limited Instinct ability, which only seemed to regenerate when new costumes were assumed. By pressing the right shoulder button, Agent 47 can utilize the incredibly helpful mechanic to see enemies through walls, note their specific paths and blend in while walking by them. The option works well when it’s available, but runs out rather quickly, placing emphasis on stealth kills and evasive maneuvers. As expected, the A.I. is tough, so make sure you plan before acting. Unless you decide to go in with guns blazing, a lot of your in-game time will be spent hiding behind cover. Moving from one hiding spot to another is key, and you’ll learn that quickly, because being seen quite often leads to a game over screen. Waiting behind some sort of a blockade allows you to quietly assassinate foes using silenced pistols, or sneak up on them without being spotted. Let’s stick with the gunplay, though, because the development team obviously spent a lot of time on that attack method. Their efforts certainly weren’t for naught, though, because the gunplay is much better this time around, as is the cover system. 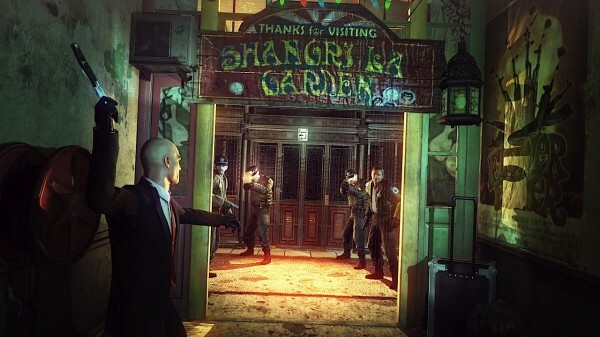 To put it simply, Hitman: Absolution is all about single player content. You won’t find any multiplayer modes on the disc, but don’t fret, because that doesn’t mean that there’s a lack of replay value. In actuality, the acceptably lengthy campaign and its varied secondary challenges are complemented by an aptly titled secondary mode known as Contracts. While it lacks player-versus-player competition in the usual sense, the customizable mode’s leaderboards make up for it. That’s because, at the core of Contracts lays a mission creator, which lets users mark their own targets and set their own parameters. All of that is done through an accessible play to create design, which is both quick and efficient. Please note that this review is based on the Xbox 360 version of Absolution, which is somewhat problematic. While it looks great and utilizes an impressive colour palette, that particular version doesn’t run as well as it should. Frame rate hiccups aren’t rare, and they mar the experience. In fact, it seemed like Agent 47 would momentarily freeze then jut forward, and the same thing would occur during camera rotations. I’m not saying that the problem is so bad that it renders the sequel unplayable, but it is something that will frustrate you. On the other side of the presentation coin lays the audio component. However, unlike its visualized peer, that specific facet of the game is great and problem free. The developers used music well to add effect to important scenes, and also went further by hiring Hollywood voice talent, including the likes of Powers Boothe, Keith Carradine and Shannyn Sossamon. 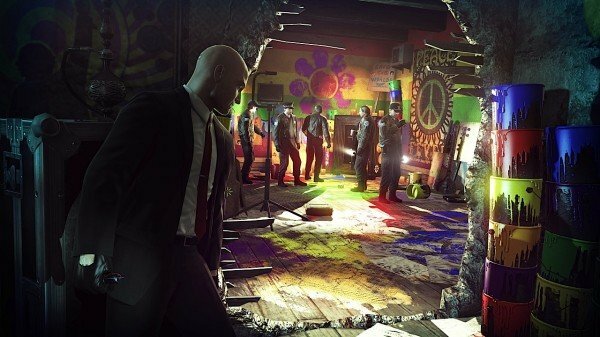 Now that the long wait is finally over, I’m happy to report that Hitman: Absolution is a must-buy, despite the fact that it suffers from an unstable frame rate. There’s much to like about what IO Interactive’s talented members have created, and you’ll find more than one reason to return. Of course, the inclusion of the secondary Contracts mode will definitely be one of them, because users are regularly creating new scenarios for others to tackle.